Intelegain is one of the leading companies in mobile app development with a number of successful projects under its belt. As is evident in our portfolio, Intelegain has assisted several prominent businesses as well as small start-ups in gaining a technological competitive edge with mobile apps that are suited to their organizational needs. From complex enterprise to social media and travel applications- We have done it all! Intelegain provides only secure and optimal performing solutions that deliver at all hierarchical positions – from the higher-executive right down to frontline workers. 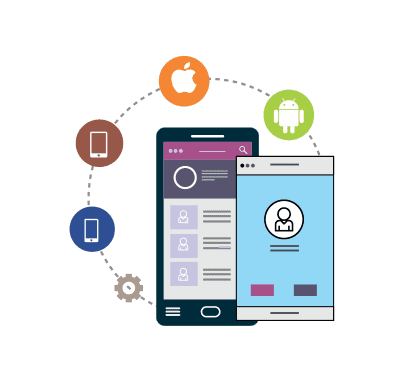 Our extensive knowledge in mobile app development enables us to find the right approach and deliver optimal enterprise mobile apps development services, as we address complications such as data security risks, insufficient employee productivity or unstructured employee supervision etc. Our experience in the domain has enabled us to cross every t’s and dot every I’s off the ideal mobile app development checklist- which envelope diverse enterprise apps with varied purposes like task-based employee apps, for sales management, training, productivity etc. We also cater to particular industries with ‘industry-specific’ enterprise apps like – legal, retail, financial services and travel etc. The Android market space has exploded with thousands of apps on the store. Here are select few from Intelegain. The iPad has been game changer for many businesses. So have been the apps developed by us for our clients. Take a look. The Android market space has exploded with thousands of app on the store. Here are select few from Intelegain. Established as industry best mobile application developers, we deliver quality solutions. Our mobile-app solutions comprise of speed, better customer engagement, revenue maximization, and sky-scraping productivity. This is because we are an all-round mobile software development company offering all-inclusive services – from consultation to solution integration, deployment and market launch. Organizations choosing Intelegain know that their final deliverable will be a high-performing, digitally radical mobile application. This is because we offer a comprehensive and all-round mobile application development services – from consultation to solution integration, deployment and market launch. Why Choose Intelegain as your Mobile Application Development Company? It is true that the user-interface plays a crucial part in the process of app development. However, successful mobile applications require a lot more than just a compelling UI/UX. These include integration, security, QA and app management. Which we as the top mobile application development company provide in spades. With our solid experience of more than 10 years in mobile development, you are guaranteed with latest industry intelligence with us. With Intelegain, you can experience Scrum, Waterfall, Agile and Spiral “tried and tested” development processes. Get in touch with us for a Free mobile application quote.